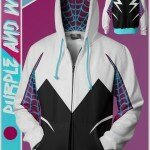 THIS SPIDER-GWEN HOODIE IS DOPE AS HECK! Spider-Gwen went from a one-off character meant for a crossover event to a full-blown fan sensation overnight – so much so that she’s getting her own comic series later this year. Show your love for the web-slinging Gwen Stacy from an alternate dimension with this custom-made hood from Coyote Pop Clothing available on Etsy for $69.